Dental veneers are thin, tooth-coloured shells that cover the front surface of the tooth to improve its colour, shape, length and size. What types of dental veneer are available? Dental veneers can be made of porcelain aka ‘Porcelain veneers’, of white composite filling material and called ‘Composite veneers,’ or ‘Cosmetic bondings’. Each has advantages and disadvantages: porcelain is the most aesthetic and requires multiple appointments. 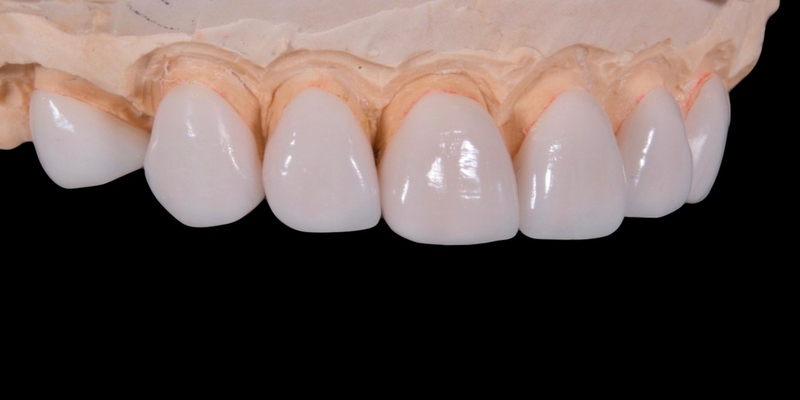 To achieve the desired outcome, they are made by a skilled technician from ‘teeth’ impressions. Because of this, they are significantly more expensive than their composite counterpart; these are placed directly into your mouth and usually take a long single appointment. These veneers, in skilled hands, can still achieve superb natural looking results and are a cheaper, less destructive way to correct and restore more minor cosmetic problems – particularly in younger adults. Porcelain veneers do resist staining from your diet (e.g. coffee, tea and red wine) and smoking better than composite veneers and stay looking good for longer. Different porcelains can be used: each has slightly different optical properties and strengths and will be selected for different cases, in order to give your teeth a very natural and attractive appearance. Porcelain veneers are responsible for the most of the dazzling white smiles we see on celebrities and movie stars… particularly those who are slightly older. Just remember, if it looks a little too perfect or too good to be true, then most of the time they have had veneers! • They can be used in combination with other cosmetic treatments such as whitening, crowns and bridges. • Can be customised for you as part of your smile design. Veneers can fix a tooth, just a couple of teeth, all the teeth (only those visible- since it is for cosmetic purposes), or to mix and match with certain other treatments in order achieve your cosmetic goals. For example, you may whiten your teeth and only really need the gap between your front teeth addressed… so just have two veneers instead of six or seven. Remember though, like anything we do in dentistry, with time, there could be problems further down the track. What are the risks, and potential complications of veneers? Like any dental treatment, porcelain veneers (and to a lesser extent composite veneers) are not without their risks – things can and will go wrong from time to time. It’s important to understand the limitations, side effects and possible problems that can occur with any treatment you are considering. Factor in any costs that may be required to correct it. • Staining can occur- we see this much more commonly with composite veneers. • Veneers can chip, break– this would mean a new veneer. • They can come off- in most circumstances they can be re-bonded if this happens. • They are expensive (porcelain veneers cost much more than composite veneers). • They are not reversible and so once you have veneers, you will always need veneers. • Your teeth in most cases will need to be prepared (filed down slightly)…it’s important to stay on the enamel for bonding strength. • They may need replacing at sometime in the future, if the aesthetics become compromised – gums will shrink over time and sometimes this can become aesthetically less pleasing, especially when the margins of the veneers get revealed 10- 20 years down the track. • The healthier your teeth i.e. less filling material, the better the bond and strength. • Crooked or misaligned teeth may be better treated with braces or Invisalign- this will need to be discussed. • Decay can still occur around them- brushing and flossing become extra important. Why should you have veneers? What problems can it solve? If you want a really beautiful white even smile of the ideal proportions a cosmetic makeover with veneers is an excellent way to achieve that. Veneers are great for transforming the look, shape, colour and size of one or many of your teeth. The best candidates have largely healthy teeth and gums, and are simply looking to improve the appearance of their smile. That said, the more discoloured, out of position, worn down, ugly or restored the teeth are – the greater the need for cosmetic treatment and the more dramatic the final result will be. If you have weak, damaged or heavily filled teeth, then dental crowns may be a more suitable option. And, of course, as part of a simple makeover. “I’ll begin with a discussion about what you are trying to achieve, what you like, what you don’t like and your budget. I’ll then perform a full examination of your teeth, mouth, bite and face and discuss any options (with their pros and cons) that may be appropriate to you so that you can make the best decision for your particular situation. These are carried out over two appointments. The first appointment will involve making you numb and preparing all the teeth. To prevent the veneers from appearing too bulky, the teeth will be smoothed down to allow space for sufficient thickness of porcelain (both for strength and for aesthetics). An impression will be taken to send to the lab on which the technician will fabricate the beautiful veneers to the required prescription. A shade will be chosen and whilst the veneers are being made (about a week), a temporary may or may not be placed depending on circumstances. When you return to the surgery, the veneers and the teeth will be checked – to make sure you’re happy, then assuming everything is good… the teeth will be cleaned and the veneers bonded in. The cement will be cleaned up and your bite checked to ensure it is even and correct. You’ re good to go! This involves a single long appointment. Dr Jamie will have taken previous impressions of your teeth and had the ideal dimensions waxed up so he can create a putty key to guide the placement of the veneers- particularly if the shape and length are being changed. Again you will be made numb, and white filling material of the selected shade will be bonded in increments and layers to the front of your teeth, then shaped and polished to a high shine to mimic natural tooth structure. Your bite will be checked and you will leave the surgery with a new smile! A composite veneer or tooth bonding will probably look good for 5-7 years. It will look its best when it’s first done and will wear a little over time, depending on how well you look after it with your lifestyle and habits. It may need touching up, or re-polishing on a few occasions: this is normal and is easily accomplished. Porcelain veneers could be expected to last about 10 years or more. Generally, they don’t just fall off at this point, simply they might not look as good as they once did and if this isn’t acceptable to you, then they’d need to be replaced. Composite veneers can often be easily repaired, but issues with porcelain veneers may need may require a full replacement. As we’ve mentioned veneers aren’t reversible. Even if they claim to be ‘no prep’ or ‘minimal prep’ most of the time some level of drilling is required. Once the veneers are in place… they are there for good… you’re always going to need something there… you can’t just whip them off, change your mind, and be back to where you started! For this reason it is always wise to consider less destructive, more minimal cosmetic treatment options such as tooth whitening (which is where Dr. Jamie always advises you start). Sometimes this can give you the just the boost in confidence that you are looking for… without the need for more expensive and extensive treatment. Nothing is ever quite as strong or smooth as your natural teeth, so you do need to take some steps to protect your investment and your smile. Once the veneers are in, you are pretty much good to go and can eat, chew, drink and smile. If you have been given anaesthetic, it will take a few hours to come back to normal so be careful during this period: don’t have anything too hot since you can’t tell temperature; be careful not to bite your lip. You may experience a bit of sensitivity, but this is temporary: use a sensitive toothpaste to help. If you are a ‘grinder’ or ‘clench your teeth’ you should get a protective splint. If you play a contact sport get a quality dentist-made mouthguard from Dr Jamie. You need to keep excellent hygiene: brush and floss your veneers to avoid decay and gum disease; have regular check-ups to make sure everything is on track. If something happens to a veneer then you should give us a call and come in at the earliest opportunity and let Dr Jamie take a look.